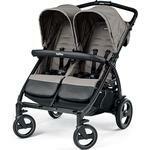 Peg Perego Book For two Strollers - Free Shipping! Why choose Book For Two? Because Book For Two is the side-by-side twin stroller that stands for performance and nifty features. Book For Two is suitable for twins or close siblings, from birth (0-36 months) and its 74 cm of width make it possible to stroll even in the narrowest streets. Sturdy and super agile, the Soft-Ride wheels allow it to travel on any terrain. 2 hoods with peep-hole and net, toy holder, spacious basket with 3 storage pockets. The backrest reclines in multiple positions, even all the way down. Open and close front bar. Matching Primo Viaggio SL car seat. Foot Muff, Rain Cover All, Bag, Stroller Cup Holder, Baby Cushion, Vario Foot Muff, Book Board, Parasol. Car Seat Adapter for 2 Primo Viaggio SL car seats (available for 2016). Car Seat Adapter for 1 Primo Viaggio SL car seat (available for 2016). Book-fold. Once closed, it is free standing, the fabric does not touch the ground so it stays clean. 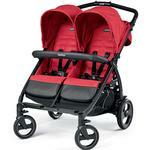 Centralised rear handle for folding and for carrying the stroller comfortably like a trolley case. Adjustable, with peep-hole and net for the warmest days, toy hook. Wide and comfortable seat with 5-point safety harness. Reclining backrest adjustable in multiple positions, even all the way down. Adjustable leg rest. Soft-Ride with Easy Drive System, with suspensions and 12 ball bearings, highest manoeuvring comfort and 30% less effort required compared to ordinary strollers. Front wheels: lockable or swivelling (ø 20 cm); rear wheels: ø 27 cm. Removable wheels to make room for more space in the trunk. Lacquered aluminium - a solid structure to control movement stability but at the same time light enough to be very easily manoeuvred and carried. Suitable for children from 0 to 36 months. Available in black.